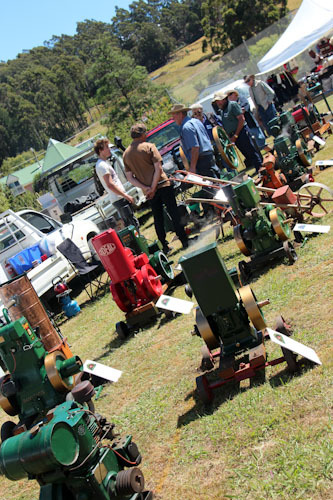 We’ve travelled back south of Hobart just to attend the Middleton Country Fair today. 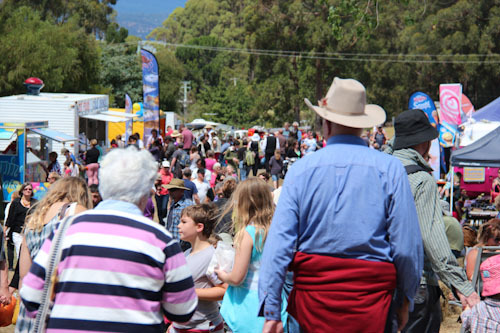 Twenty-two years ago, the local area held an expo to promote bed-&-breakfasts and local artisans, now this annual fair is more of a family fun day out with food, animals, bands, demonstrations and stalls. It was interesting to arrive in Middleton yesterday. A number of buildings and small businesses denoted the village’s presence, but there was very little happening. 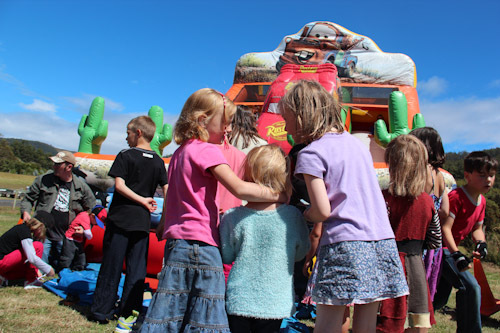 Today, however, the village was transformed into a magnet for families from all over southern Tasmania. Cars parked against side roads and along the esplanade, and a paddock one kilometre away from the fair offered more parking — and a free shuttle bus — for those who didn’t want the hassle of trying to find a parking spot. 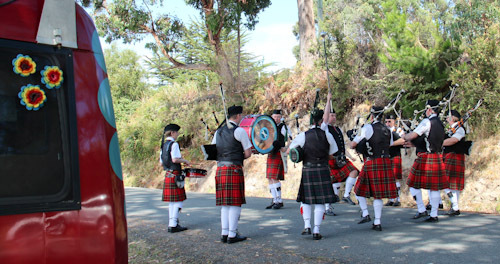 The Hobart Highland Pipe Band congregated directly behind our bus and practised their marching and playing before heading to the fair. Organisers estimate that over 2500 people visited today's fair, though with children admitted for free it's hard to compile accurate numbers. As soon as we entered the grounds attached to the community centre, our girls spied the jumping castle and queued for their own turn. Our girls prefer to stick together when entering a playspace with a large number of other children. 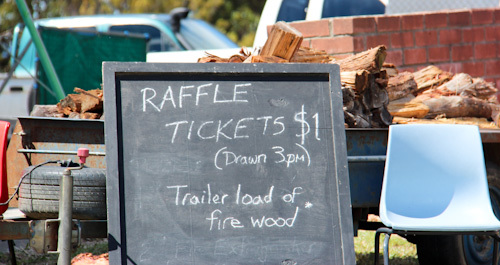 Off to one side, a trailer load of firewood is offered as a raffle prize — indicative of the perceived value of such a prize in this part of the country. The best way to enjoy a country fair is slowly. Without an agenda, we meandered along the stalls, looking at exhibits and assessing our food options. I was delighted to find fresh vegetarian food on offer, and we eventually settled down for a picnic and to watch the show. The Old Bits & Pieces Club set old motors chugging in their demonstration of vintage machinery. Calista is attracted to this pretty little crocheted owl. We inspect the newly-shorn sheep and the still-woolly sheep in the centre of the fair grounds. 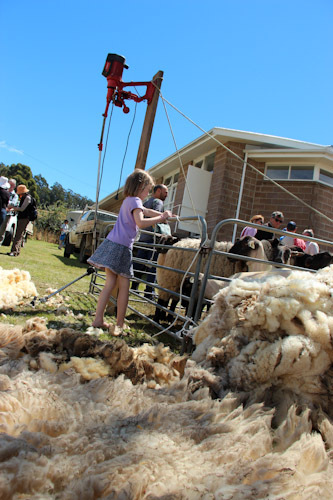 The shorn fleeces are given to local spinners and weavers who will make the wool into something wearable for raffle prizes for next year's fair. 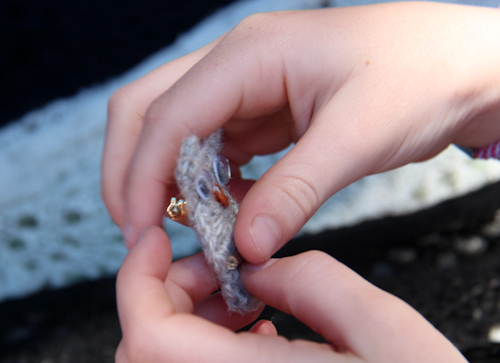 I love the way the fair activities and prizes are self-perpetuating with the assistance of keen craftspeople! 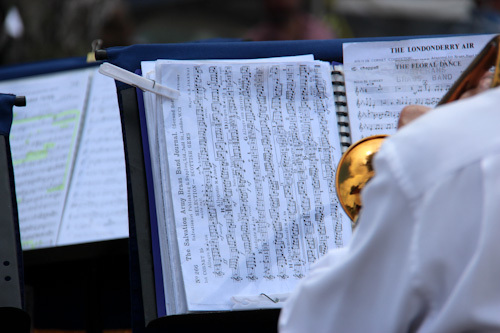 We buy some food and sit down to enjoy it, close to where a local band is playing a variety of popular pieces. 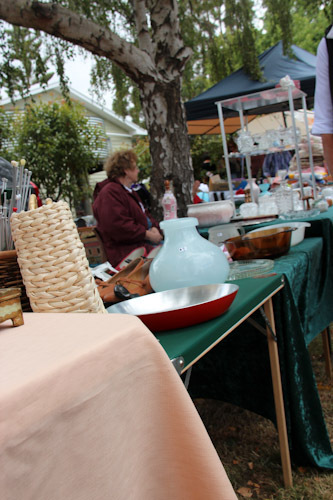 A number of stalls are personal secondhand items, adding variety and interest. 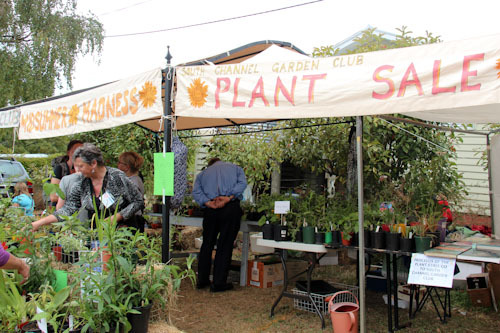 The local garden club's plant stall is particularly popular. I'm delighted to see Brenda again. 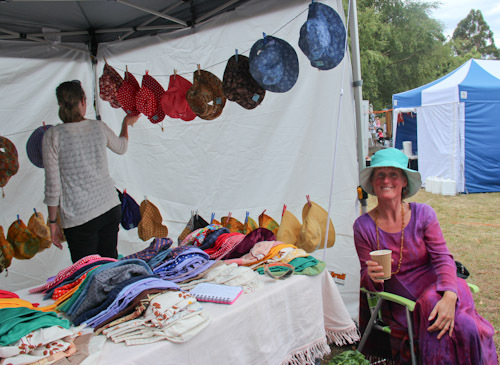 We met at CircusFest and she told me that she made hats for the market circuit. 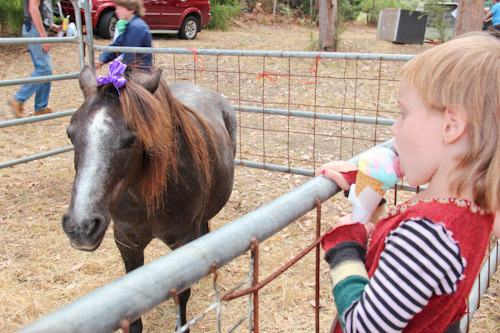 We visit the miniature horses and donkeys that are kept in pens at the top end of the fairgrounds. We watch as Missy the sheepdog keeps the sheep bundled up in the corner of the pen. 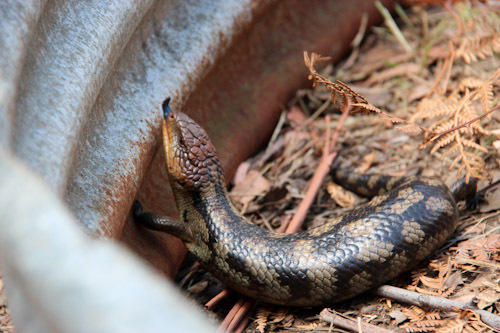 Half a dozen blue-tongue lizards are roaming within a metal pen under the watchful eye of two boys who let us touch but not hold them. 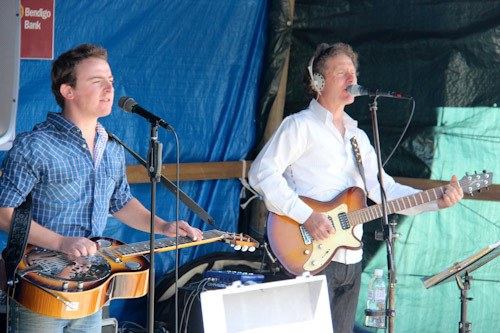 The main stage provides live entertainment for hours. 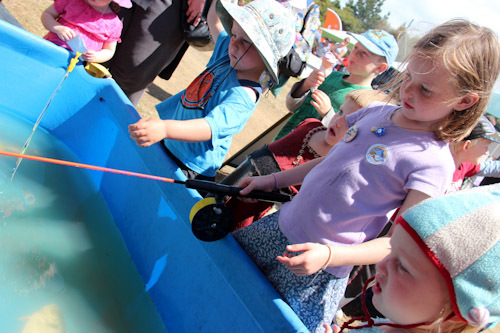 We stop to try our fishing in a small pond set up by a fishing conservation group. 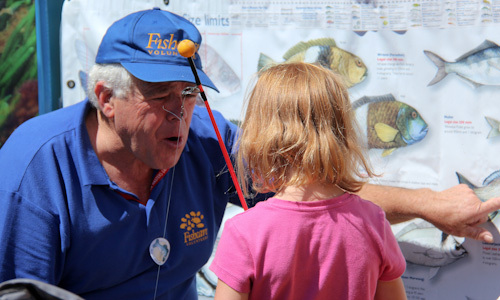 After Brioni catches a fish, she identifies it with the help of a volunteer and compares its size to the legal limit displayed on a large poster. 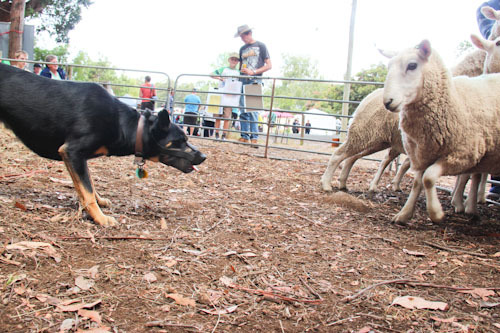 We’ve visited bigger country fairs before, but the Middleton Country Fair retains a small-town atmosphere where you can chat leisurely with the stall-holders and the owners of the animals. Our girls enjoyed their day out, and I’m sure this fair will keep getting better and better each year! I think a local country fair really gives you a good feel of the community spirit in an area. I love browsing through country fairs. I find them friendly spaces to be in for a while, filled with people willing to just have a chat as you browse through their wares.